Levuka Historical Port Town is an urban landscape in the Pacific that represents 19th century British colonisation. Local warlord Cakobau set up the first administration of the Kingdom of Fiji here in 1852, supported by foreign settlers. In 1874 the land became part of the British Empire. The site includes residential and commercial buildings, churches, schools and constructions related to port activities. Its May in the South Pacific and we are into the dry season. My wife and I have spent the last three weeks, with two other couples enjoying and exploring a myriad of different islands. It is interesting to distinguish the differences between the Melanesians, Micronesians and Polynesians. Also I am reading the wonderful travel book, 'The Happy Isles of Oceania' by Paul Theroux. Everyone is packing to go home except I am doing a last excursion to Levuka on my own. No one else wants to make this trip and Mrs Sun insists its time for her to return home to see her grandchildren. So after sending them off at Nandi, Fiji to fly to Los Angeles, I start my attempt to hit another WHS. If you are in this part of the world, most international flights come in and out of Nandi, Fiji. From here to get to Levuka is quite an effort.First of all, you need to get to Suva, the Capital of Fiji which is 4-5 hours by bus across the main island of Viti Levu. Then you overnight and catch the early bus from Suva to Levuka which is 2 hours by land and 45 mins by ferry to the island of Ovalau and then another 45 mins round island on gravel road where you will be deposited in downtown Levuka. The return bus starts out at 4.00am! Its a one street town and so you cannot get lost. Look for the Royal Hotel for a room. The hotel was built in the 1860s and is the oldest in Fiji and claims to be the oldest in the South Pacific. They have clean rooms, some with kitchen but no hot water. There are also two B&B places in town with 5-6 rooms each. I am flipping through the sign in log and notice that there are no more than 5-6 international visitors each month. The rest are local Fijians who come to work at the Bumble Bee tuna canning factory on the outskirts of town. That translates to under a 100 tourists a year. I was told that in 2013 after the WHS inscription there was a flurry of visitors but it has dwindled. Cyclone Winston also hit the town very badly in 2016 and many buildings are still shut from damage. Its a very small town and I walk up and down the main street 3-4 times looking into every store. 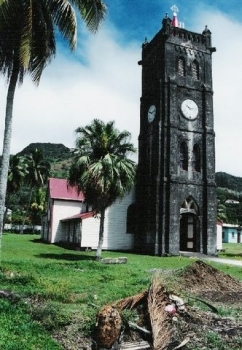 The town was built up in the 1870s when Fiji was ceded to the British here in Levuka. The buildings are built with Oregan timber and is mostly one or two stories with a frontal facade. The foot path in front of the buildings used to be the ocean front. Overtime they built a veranda in front of the buildings and the road in front has been reclaimed land. I am pleased to say that its now paved with a sea wall. Outside town, the road is gravel. It reminds me of old Hawaiian plantation towns At the end of town, is an old grocery and draper with a facade of Morris Hedstrom Ltd. Built in 1868, its was the first liquor store in Fiji and now its the library, museum and tourist information. I meet Lydia who is the official guide to Levuka and ask her to take me on a tour. The cost is only $10 Fijian and she reluctantly agreed because there is a minimum of 4 for a tour. She confesses that this is the first tour of the year. So if you are there, tell her that you need to do the tour and she is very nice about it. Besides there is nothing else to do in Levuka and you are stuck for at least overnight. The WHS plaque is prominently displayed right by the sea wall mid town. My impressions are that the town is certainly historical for Fijians and the buildings are authentic enough, though getting funds for repairs from the cyclone using timber from Oregon would be challenging. Its not easy to visit but my rationale is that visiting the South Pacific is in itself a challenge and so tacking on this side trip is ok. The biggest downside is that the tuna canning factory emits a very strong dried fish odor that is constant everywhere. Its something that I am used to but I can see how it can be nauseating for those who are not used to it. Well Levuka was a home for me ten years back. The Heritage is like a candle light that never fades away. With the old style of nature and free- styled multi-cultural society, I felt that theres no reason to seek for transfer. I have been to the peak a couple of times with my brothers and sister, have travelled to St John College twice and did my practicum at Levuka Public School. At the moment I am still looking forward to taking my children to this beutiful and peaceful town to experience the love and peace of Levuka and its, although old but free and friendly nature. I am glad to see that Levuka is inscribed in the World Heritage Listing after many years of struggle to preserve, safeguard and promote one of the many historic landmarks in Fiji' Levuka is unique amongst many countries of the world.I had visited Levuka Town before the inscription in June 2013 and hope to see many revitilisation and work in terms of keeping Levuka town since the government is pouring funds into the maitenance of this historic port town. Was based there for 5yrs with Customs...2000 to 2005.wonderful place and people.Sites and many great things to see.Listening to the history of the place told by the elders is also another great experiance.So glad the sight has been approved for World Heritage. From 1874, when Fiji was ceded to Queen Victoria, until 1879 Levuka was the capital city of Fiji. Actually it was little more than a village, one kilometer from end to end. Once the capital was transferred to Suva its decline began. An attempt to revitalise it was made when a tuna canning plant was built, but otherwise, the streetscape along the waterfront from the Cession Stone to Gun Rock remains pretty much unchanged. Even if the streets have reverted to gravel, as they would have been in 1879, Levuka still has its charm. I was born in Suva Fiji in 1975, and schooled at Leveuka Public School from 1983-1987. In this time I loved everything about Levuka, the people, culture, heritage and the good times. It was evident then that the national language was English, as I had to learn it straight away. But 26 years after 1987, I visited Levuka on the day it was listed under world heritage, I so surprised,I arrived that night and the next day went to the museum and spoke a couple of people and asked them what the heritage listing meant for them. It is great honor one said, and the other said hope it brings in more tourists. My personal take on Levuka was sad, in some ways as the place seem to have been abandoned in some regards, with the LEvuka club closed, Masonic hall burnt, the roads were gravel where they used to be sealed. Just seemed to be a town that was struggling, I hope with this Heritage listing the government of Fiji really puts their effort into this town to promote and preserve it. My son aged 10, daughters aged 6 & 3 really loved Levuka. It still is Levuka, and it was great getting back to this beautiful place. Notable Hotels: The historic Royal Hotel dates to about 1860 but was rebuilt in 1917 after a fire destroyed the original building.